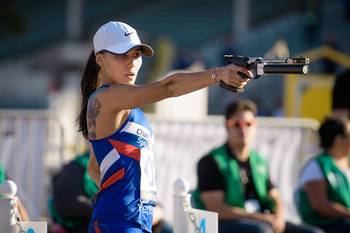 Gulnaz Gubaydullina of Russia confirmed her status as world No.1 with a well-controlled victory in a strong field in the Women's Individual Final at UIPM 2018 Pentathlon World Cup Los Angeles. The 2017 world champion performed consistently throughout the day and moved from 2nd to 1st with great conviction in the Laser-Run to win gold by a margin of 7secs. Alice Sotero of Italy performed strongly to claim silver while Tamara Alekszejev of Hungary ensured a podium finish with bronze after losing the lead in the deciding discipline. The top 10 was made up of three athletes each from Italy and France, with Julie Belhamri (FRA) recording a superb Laser-Run time of 12mins 20secs to finish 4th. Olympic silver medallists Samantha Murray of Great Britain and Elodie Clouvel (FRA) finished 5th and 6th respectively while Bian Yufei of China came in 7th. Victory was another reminder of the exciting talent and dedication of Gubaydullina (RUS), who said at the finish line: “It was a very hard day. Swimming pool: hard. Horse: hard. Fencing: hard. Everything was hard! The bronze medal also confirmed the prominence of Alekszejev (HUN), who was a surprise winner of the 2017 World Cup Final. She said: “I’m super happy to be in USA as LA is my favourite city and I like to compete here in the warm weather with the beautiful mountains. “Today my best discipline was Fencing but I was not so happy about my Laser-Run, especially my shooting. In the end I pushed really hard to stay on the podium. 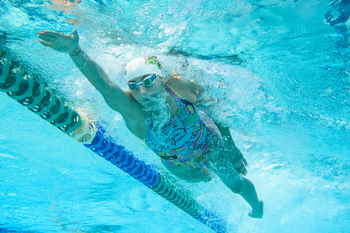 The day began well for the world No.1 as Gubaydullina (RUS) swam fastest in 2:08.45, an improvement on her time from her pace-setting time at Pentathlon World Cup Cairo, ahead of Clouvel (FRA) in 2:11.01 and Sotero (ITA) in 2:11.65. Alekszejev (HUN) matched her score of 25V/10D from Cairo in the Ranking Round, and this time it was enough to put her at the top of the standings as Iryna Khokhlova (ARG) managed one victory fewer. Natalya Coyle of Ireland also stood out with 24V/11D, while Murray (GBR) was among a group on 23V/12D and Gubaydullina (RUS) kept in touch with 21V/14D. In the Bonus Round, Francesca Tognetti (ITA) enjoyed a superb run of victories, winning the last four bouts to give herself an additional 4sec to play with in Laser-Run. Murray (GBR) also took the opportunity to increase her score with some great form on the showpiece piste which gave her a narrow overall lead. Six athletes managed a clean round for a maximum 300 points, including Cairo gold medallist Clouvel (FRA) and her compatriot Oteiza (FRA). There was a moment of joy for the home crowd as Samantha Achterberg of USA enjoyed a clean round after struggling in Fencing, while Isabella Isaksen (USA) scored 298. The other athletes who managed a perfect score were Alexandra Bettinelli of Germany, Sarolta Kovacs (HUN) and Kseniia Fraltsova (RUS). Alekszejev (HUN) maintained her challenge with only one penalty point conceded. The standard was very high with 21 athletes incurring 10 penalty points or fewer. However, Murray (GBR) lost some ground with her score of 279 and Coyle (IRL) fell out of contention after picking up 58 penalties. Alekszejev (HUN) started with a lead of 9secs but Gubaydullina (RUS) immediately made up some ground on the first lap as Sotero (ITA) moved past Marie Otiez (FRA) into 3rd. Gubaydullina (RUS) claimed a narrow lead at the second visit to the shooting range, while Sotero (ITA) showed great tenacity to create a leadership group of three. Behind them, Belhamri (FRA) moved rapidly through the field and into 4th place. At the 3rd shoot, Gubaydullina (RUS) opened up a 10sec cushion and it was clear in this moment that it was going to be her day. Sotero (ITA) in turn created a gap between herself and Alekszejev (HUN) but all three finished strongly to confirm their places on the podium. 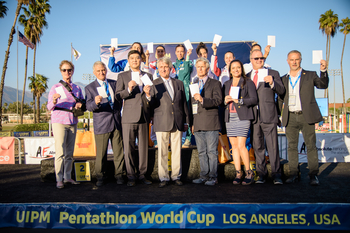 UIPM President Dr Klaus Schormann said: “We are happy to be here for the second Pentathlon World Cup of the season at Fairplex, close to the 2028 Olympic Summer Games host city Los Angeles. 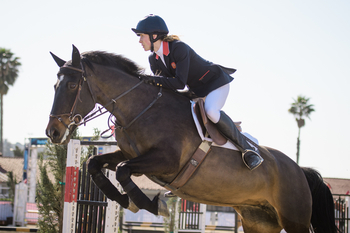 “We have good conditions here in terms of weather, good horses and high-level athletes, and we see very young and new athletes coming to the World Cup, but also the result shows that the best athletes from last season are again on the podium. 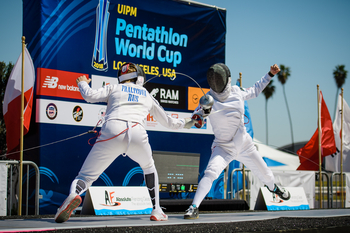 UIPM 2018 Pentathlon World Cup Los Angeles continues tomorrow (March 29) with the Men’s Final before the Mixed Relay concludes the competition on March 30. For full results visit the UIPM website.